Last week we guided you through writing a C program that uses sysfs for edge detection interrupts on the Omega’s GPIOs. This week, we’ll build on this topic and write a program that executes a terminal command specified by the user when a rising or falling edge is detected on a GPIO. To show you how this can be used in real life, we’ll also build a push-button circuit that we’ll use as the trigger for our new program! 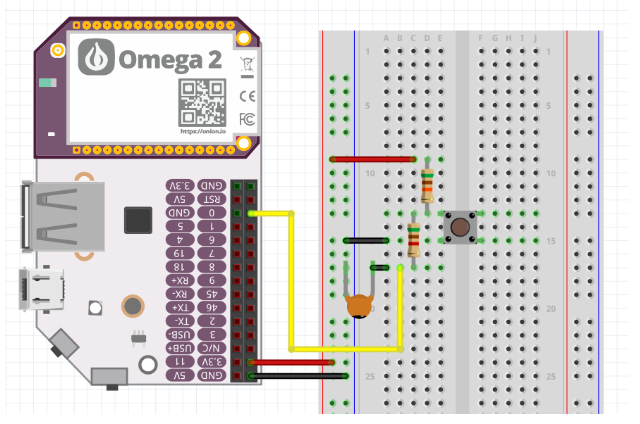 You can freely re-use this program to make all sorts of button triggered projects with your Omega: IoT buttons, motor controllers, light controllers, and so on. Last week we got familiarized with the how the GPIO edge detection code works, the C makefile, and cross-compilation for the Omega. Since our code doesn’t use any external C libraries, we’re going to shake it up and compile the new program on the Omega2! If you haven’t installed gcc, the C/C++ compiler onto the Omega, please follow our earlier 2 Bullet Tuesday, Compiling C & C++ Applications. If the arguments are all present and make sense, the program then make the GPIO available for use with sysfs, set the GPIO edge we are interested in, and start an infinite loop that uses pollfd for edge detection. If an edge (a change in the GPIO value) is detected, the new value of the GPIO will be read and the program will make a system call to perform the action specified by the command line arguments. Since this is in an infinite loop, this will continue indefinitely – executing the specified action every time the button is pressed. You will notice a couple of warnings while compiling the code. You can safely ignore them as they won’t affect the program’s operation. Also, you will notice a new file: an executable called gpioIrqTrigger! Now it’s the time to build our push-button circuit. When the button is pressed, it will cause our GPIO to change value, thus creating an edge, which will trigger the action to be executed! If you get stuck with the circuit at any point, check our our Arduino Dock Starter Kit push button experiment. In our case, we chose to test it with GPIO0, falling as our edge and echo a message:. If your <ACTION> argument contains any spaces, make sure to wrap it in quotes so the program knows to treat it like a single argument! So let’s break down how this works. 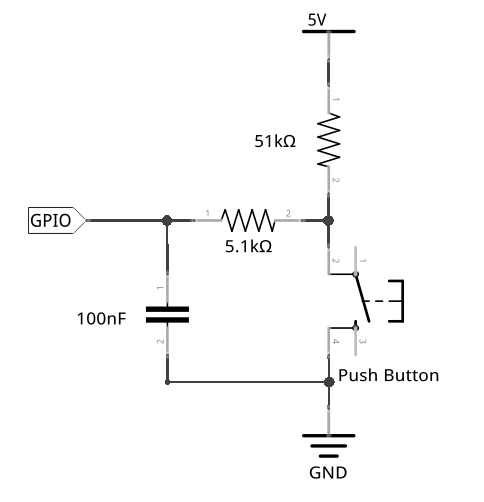 Because of the design of the push-button circuit, the GPIO is held high when the button is not pressed. Pressing the push button completes the circuit, meaning that the GPIO will go from High to Low, creating a falling edge. Our program will react to the falling edge, and execute our action, you should see Hello World pop up on your screen. When we release the button, the GPIO goes from Low High again (rising edge), but will not trigger our action since we’ve specified we only care about the falling edge. The same concept applies for rising and both edges, try it out! 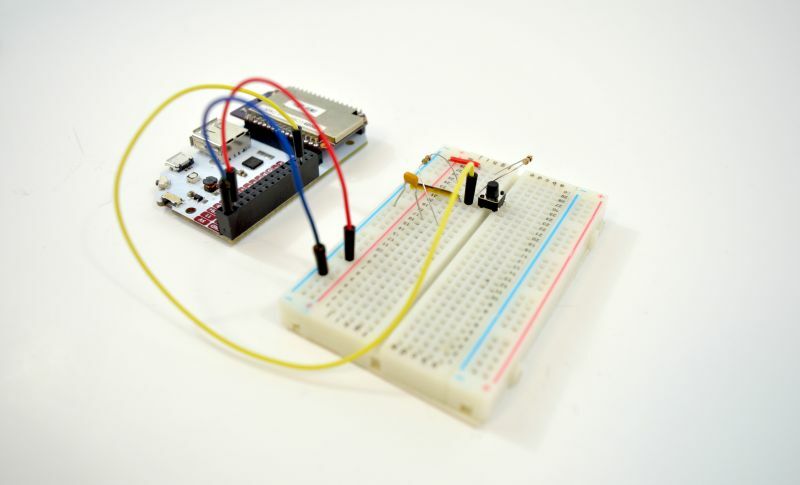 Now, it’s your turn to make some awesome, button-controlled projects and share them with us! Try using some of the C Libraries we’ve put together! Happy Hacking!